Russian Patriarch Kirill completes a three day visit to Serbia with the blessing of a monument to Russia’s last Tsar. MOSCOW, November 16 (Sputnik) — A monument to the last Russian Tsar Nicholas II was unveiled in Belgrade on Sunday, in the presence of Serbian President Tomislav Nikolic and Patriarch Kirill of the Russian Orthodox Church. 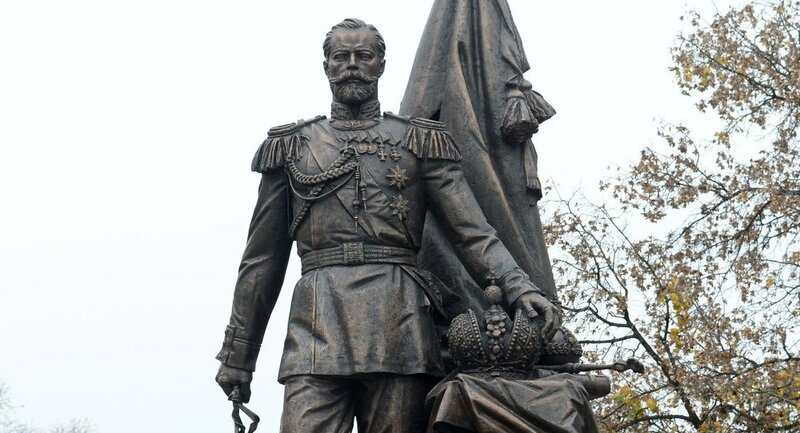 “This monument in the heart of Belgrade radiates with the honor of martyr Nicholas II, as a sign of the eternal victory of virtue and justice, of sacrifice for values greater than man and Tsar, greater than life,” said President Nikolic at the ceremony, Serbian news agency Tanjug reports. Nikolic told the hundreds of assembled onlookers that the monument, a gift to Serbia from the Russian Federation, will now become one of the many significant memorials raised in the capital honoring their Russian comrades from both World Wars, and will give Belgrade “a place where we will remember the values” of the two countries, exemplified by last Russian Tsar. “It is as though one hand wrote the history of Serbia and Russia,” the president continued. Among those present at the ceremony were the Russian President’s Special Envoy Konstantin Kosachev, Russian Ambassador Alexander Chepurin, Mayor of Belgrade Sinisa Mali and Patriarch Irinej of Serbia. The imposing bronze monument, seven and a half meters tall and weighing over 40 tons, was designed by Russians Andrey Kovalyuk and Gennadiy Pravotorov. It is the second memorial in Serbia to Russia’s last Tsar, after a monument built in 1935, which lies in Belgrade’s Novo Groblje cemetery. On Saturday Patriarch Kirill visited the Novo Groblje monument, which was built as a memorial to the Russian Tsar and also to those Russian soldiers who fought in the Balkans during the time of the First World War. “God bless Serbia and Russia, our nations and churches,” said the Patriarch, according to RTS. The blessing of the new monument marks the end of Patriarch Kirill’s three day visit to Serbia. Earlier on Saturday the Patriarchs undertook a joint liturgy in Belgrade’s Church of Saint Sava. Serbian Patriarch Irinej presented Patriarch Kirill with the Order of Saint Sava, for the “love he has shown towards the Serbian nation.” Previous recipients of the Order include Russian President Vladimir Putin and former Russian President Dmitry Medvedev.